Ulcer Index (UI) is a tool for measuring investment risk that addresses maximum drawdown of an asset value, unlike the commonly used standard deviation (SD) of return. UI measures the depth and duration of drawdowns in asset prices from earlier highs. The index was developed by Peter G. Martin in 1987 and was first published in The Investor’s Guide to Fidelity Funds: Winning Strategies for Mutual Fund Investors. The ulcer index is based on maximum drawdown in an asset value a portfolio experiences over the analysis period. It is a volatility measure that ignores upside movements and captures only the continuous downside volatility. The longer the drawdown, the higher the UI. Ulcer Index is the root mean square (RMS) or quadratic mean of all drawdown values, D1 through Dn. Note that each Drawdown is a percentage drop from the moving maximum price, so the Ulcer Index can be expressed as a percentage as well. Let’s say we take weekly Drawdowns and pick N=208. That was the last four years of weekly prices taken, since 4*52 = 208. Ulcer Index Indicator in this spreadsheet is easy to use. Just plug in the symbol, start, and end date ranges. The program performs all the necessary calculations behind the scenes and plots Ulcer Index chart. The excel spreadsheet in this example builds Ulcer Index on a 14-day day rolling period. 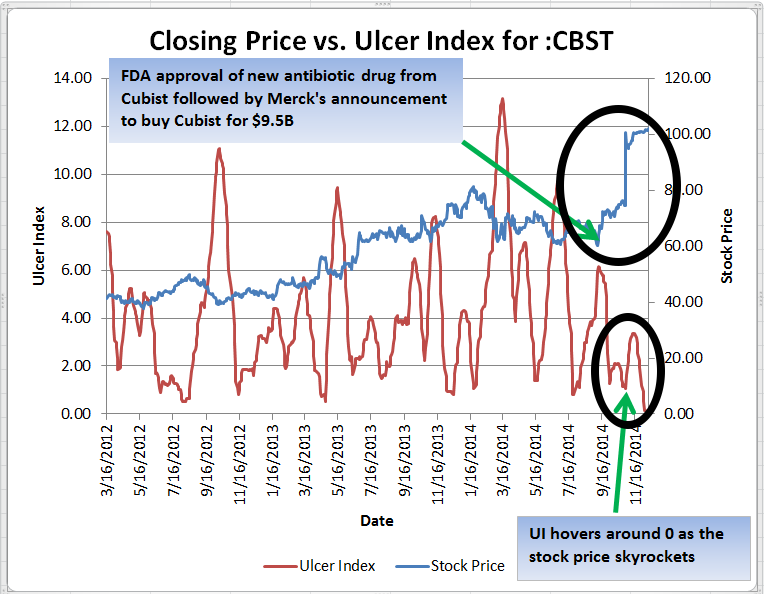 Let us take the case of CBST (Cubist Pharmaceuticals) which has been in the news lately. The closing prices have been tracked since Mar-18-2013 to Jan-18-2015 or a 22 month period to study the Ulcer Index model. Note that UI drops below 1 on Nov-02-2014 and then hovers around zero for the remainder of 2014. During this period, the stock price skyrocketed to 100. This could have been primarily due to FDA approval of Cubist’s new antibiotic drug on Dec-19-2014 and the announcement of subsequent takeover by Merck & Co in late 2014. Standard Deviation does not cover all the gamut, and is a poor performance measure. This can be improved by simply replacing SD with UI which mainly focuses on downside risks. This new performance measure has been coined as “Martin Ratio” or “UPI” (Ulcer Performance Index). The calculation should factor in compounded annual returns, dividends, distributions, and transaction costs for consistency. Ulcer Index measures risk by factoring in drawdowns represented by price declines. UI is targeted mostly for investors with long positions. The index oscillates around zero when prices record prolonged advances. The index rises when prices move lower from their recent highs. Hence, UI tracks downside risk and can be extended to calculate risk-adjusted returns. Spreadsheet works good BUT is password protected. Fixed. The link should be working now.